At 11:11am sharp — not! At the (now defunct) Artful Lodger (a place we miss dearly, especially Ede and Fred). We were thinking about wearing leis, and Rich actually did. Also, Rich wanted us to go barefoot, but the concept of pedicures hadn’t yet entered my consciousness. 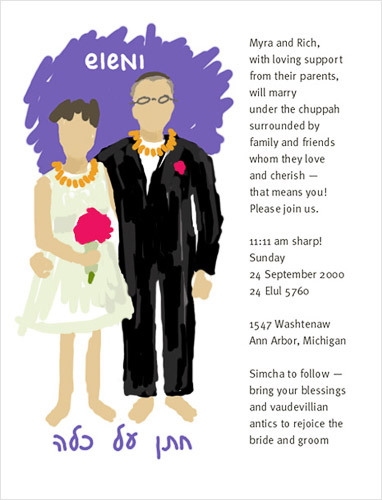 Not only would I marry my wonderful husband all over again, but we’d have the exact same wedding (except we’d include the close friends we’ve made since then). Luke and Tam at Very Different Cakes in LA. Trivia: Luke and Tam introduced us! I loved working with Karen, and later joined her knitting group. We found these guys only 2 weeks earlier at Rico’s law school 5-year reunion. They were booked months before I walked in the door. I literally begged. Peter did us a huge favor; this project wasn't really worthy of his talents. 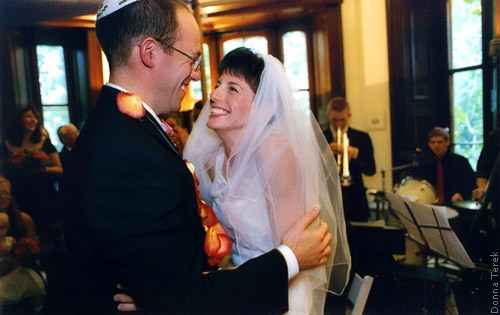 About the photographer: When we found Donna Terek in 2000, the high-quality, journalistic-style of wedding photography so popular today was only practiced by a few photographers in the area. I think we interviewed almost a dozen photographers before learning about Donna. She shot film with two camera bodies (one with color film and the other with b+w), and she shot over 30 rolls! She even set up her lights to add an extra glow in the big room where we set up the chuppah. We absolutely love how she captured that magical day! Happy Anniversary to the Happy Couple!!! Ha! That’s so cool! Happy Anniversary to you two, too! Happy anniversary! I think when I met you, you were still in the glow of that wedding, which is why you threw yourself so enthusiastically into helping us plan ours (six years on Oct. 6) — which I, too, would do exactly the same, with the same guy and everything. Congratulations! Your pictures are awesome. We only wish we had a photographer that specialized. 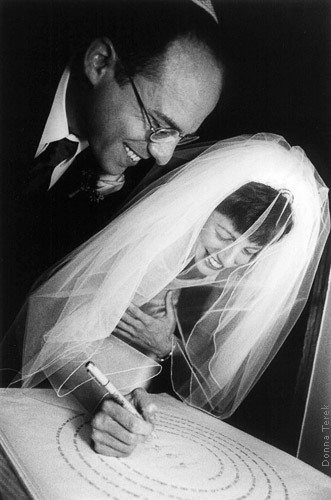 Absolutely nothing existed in terms of cutting-edge wedding photography (it will be 25 years for us tomorrow!). Even tho I expressly demanded no double-exposures, there were a few sprinkled in with the proofs. Mazel tov for 25 years, Karen!!! Ah yes, that really takes me back. As I recall, 1982 was the year that the “slip-the-bride-a-few-double-exposures-against-her-explicit-instructions” technique really caught on.